The judge was making his opening remarks at Dublin Castle this morning. 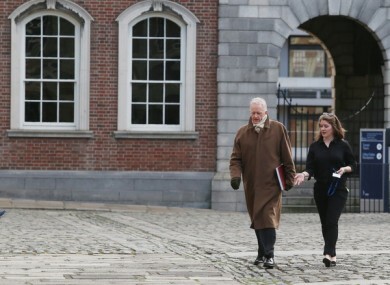 Justice Peter Charleton on the opening day of the Disclosures Tribunal in Dublin Castle. THE JUDGE PRESIDING over the new Disclosures Tribunal has said that any lie told to the inquiry will be a ‘waste of what ordinary men and women have paid for’. Justice Peter Charleton, giving his opening statement, noted that the investigation is a drain on the resources of the Irish people, saying the public wants his work to be completed expediently. The Supreme Court judge said that he has no “preconceived notions” about who is a hero and who is a villain. He called upon people with information pertinent to the probe into how whistleblowers have been treated by An Garda Síochána to provide written statements to the Tribunal solicitor Elizabeth Mullen. The central concern is whether such reaction has, possibly, and this is now unknown, not only been one of distate, but of active and thought-through malice whereby media briefings take place against individuals who rock the boat. As if that were not enough, there is an additional question as to whether those who air concerns about poor policing may also be targeted and attacked as to their family life and as to their adherence to basic standards of human decency. The first module will look at the response of Garda Commission Nóirín O’Sullivan, former Commissioner Martin Callinan and others at the highest command level to disclosures made by Sergeant Maurice McCabe and, in particular, the manner in which his character may possibly have been “undermined by calumny or detraction”. Submissions will be heard, he explained, on whether there is privilege against disclosing instructions given by a client to their lawyer as to what is to be pursued in cross-examination. This relates to the O’Higgins Commission into allegations of garda malpractice in Bailieboro, Co Cavan, during which McCabe claims the Commissioner directed her counsel to discredit him. Charleton said the tribunal was currently in the middle of reading the entire transcript of the Commission. In relation to dealings with the media, the judge said the central witness will be Superintendent David Taylor, former head of the garda press office, who claims he was told to brief the media negatively that the whistleblower was motivated by malice and revenge. The tribunal will also examine broadcasts on RTÉ television on 9 May 2016 purporting to be a leaked account of the unpublished O’Higgins Commission report and whether the Commissioner used briefing material prepared at Garda Headquarters to influence these broadcasts. Charleton said he wants to know if the media was “used as an instrument for the dissemination of lies”. He also questioned whether privilege applies when the media is used as a tool of “naked deceit”. The judge has asked anyone with knowledge of the matters in the terms of reference to send a detailed written statement to Elizabeth Mullan, a solicitor to the tribunal, at Dublin Castle, Dublin D02 Y337. Statements should be submitted by close of business on 13 March 2017. Further information can be found on the tribunal’s website. Explainer: What exactly is a Tribunal of Inquiry? Email “Charleton: 'Every lie told to this Tribunal will be a waste of what ordinary men and women have paid for'”. Feedback on “Charleton: 'Every lie told to this Tribunal will be a waste of what ordinary men and women have paid for'”.